We are having some really weird problems with our agarose gels - they are melting at standard conditions. A 1% agarose gel (made with 0.5X TAE and ran at 50 V) melts and shows a "salt boundary". We have measured the temperature of the gel (max temp is 35ºC) and it's not even going close to the agarose gel melting temperature. We have repeated the gel with new bottles of several different brands of TAE, and made sure the buffers are well mixed. We have varied melting the agarose with either a microwave or a heater/magnetic stirrer, and we are still getting the same result. The weird thing is, the gel doesn't melt if we make the gel without wells (no use of a comb), although that's obviously not useful for running samples. It doesn't happen with TBE buffer, but at this point, we really want to figure out what's going on with the TAE buffer. 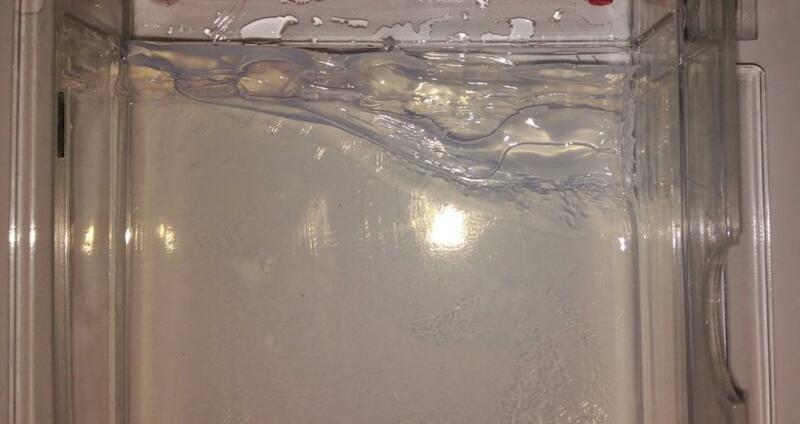 Attached is a picture of the melted gel. The melting is occurring closest to the cathode, by the wells. Any ideas what's going on? Why would the gel be less likely to melt with no wells? Edited by wadh2544, 17 November 2017 - 02:26 AM. That usually occurs when voltage is too high, check the power supply settings. Some power supplies have a low/high V/mAmp setting and is you don't look carefully you could end "cooking" the gel. It had happen to me and was an ultra purify low melt agarose the buffer begun to smoke and the gel was like slime. Also Its a good idea to connect the power supply to a power surge. I usually check the buffer temperature by just placing my hand at one side of the chamber. If too hot i lower the voltage. Also make sure that the buffer of the gel and the running are equal. RNA agarose gel blurry fuzzy. RNase contaminaton? Microinjection of cells into the lumen of spheroids ?